These brightly coloured children's wooden bookends are the perfect asset to any child's room. 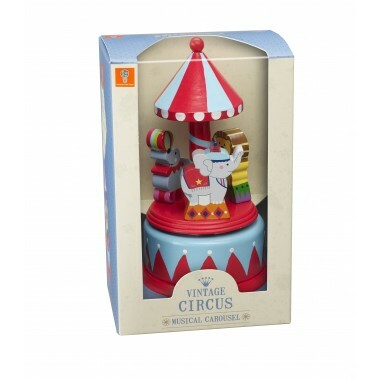 From our Vintage Circus range, these bookends will keep all your child's favourite books in place. Wooden children's bookends, to brighten up any child's room with the kids favourite characters. There are rubber pads on the base to stop the bookends from slipping. Very attractive sturdy colourful wooden bookends with delightful carved characters which would be an asset to any child's bedroom. PLEASE NOTE WE WILL BE CLOSED FROM FRIDAY 21st DECEMBER UNTIL WEDNESDAY 2nd JANUARY. Delivery for orders under £40 will be charged at £5.25. Delivery to UK Mainland only. For all other locations, please contact the office directly for a shipment quote. If you are not delighted with your purchase, you can return a product within 30 days and we will happily refund the purchase price. Ship your unused product (if possible in its original packaging), to the address below. Please note that you are responsible for shipping the products back to us; we recommend using a trackable shipping method.